Republished February 19, 2014, 3:00 p.m., to correct an error in the text. Gas-to-liquids (GTL) is a process that converts natural gas to liquid fuels such as gasoline, jet fuel, and diesel. GTL can also make waxes. The most common technique used at GTL facilities is Fischer-Tropsch (F-T) synthesis. Although F-T synthesis has been around for nearly a century, it has gained recent interest because of the growing spread between the value of petroleum products and the cost of natural gas. The first step in the F-T GTL process is converting the natural gas, which is mostly methane, to a mixture of hydrogen, carbon dioxide, and carbon monoxide. This mixture is called syngas. The syngas is cleaned to remove sulfur, water, and carbon dioxide, in order to prevent catalyst contamination. The F-T reaction combines hydrogen with carbon monoxide to form different liquid hydrocarbons. These liquid products are then further processed using different refining technologies into liquid fuels. The F-T reaction typically happens at high pressure (40 atmospheres) and temperature (500o-840oF) in the presence of an iron catalyst. The cost of building a reaction vessel to produce the required volume of fuel or products and to withstand these temperatures and pressures can be considerable. Several companies are pursuing an alternative method that uses a different reactor design (called a micro-channel reactor) and proprietary catalysts that allow GTL production at much smaller scales. There are currently five GTL plants operating globally, with capacities ranging from 2,700 barrels per day (bbl/d) to 140,000 bbl/d. 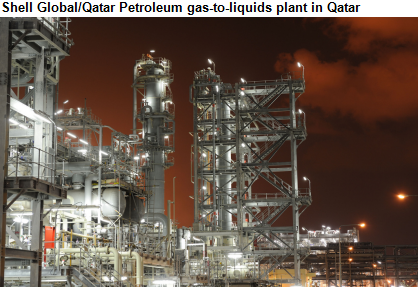 Shell operates two in Malaysia and one in Qatar, Sasol operates one in South Africa, and the fifth is a joint venture between Sasol and Chevron in Qatar. One plant in Nigeria is currently under construction. Three plants in the United States—in Lake Charles, Louisiana; Karns City, Pennsylvania; and Ashtabula, Ohio—are proposed. Of these, only the Lake Charles facility is a large-scale GTL plant. In December 2013, Shell cancelled plans to build a large-scale GTL facility in Louisiana because of high estimated capital costs and market uncertainty regarding natural gas and petroleum product prices. The Annual Energy Outlook 2014 (AEO2014) Reference case projection does not include any large-scale GTL facilities in the United States through 2040. Other uses for available natural gas in industry, electric power generation, and exports of pipeline and liquefied natural gas are more economically attractive than GTL under AEO2014 Reference case facility cost assumptions and energy prices. 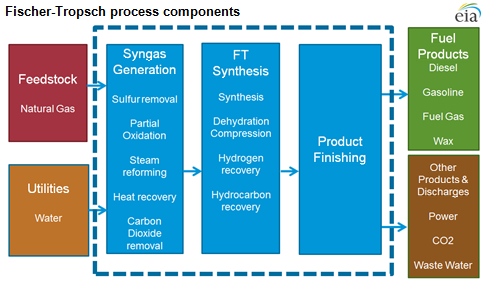 To improve the long-term profitability of GTL plants, developers have reconfigured their designs to include the production of waxes and lubricating products, which are another primary product of the F-T process. Because of the smaller size of the chemical market, smaller-scale GTL plants similar to those proposed in the Midwest are economically viable. U.S. imports of waxes similar to those produced out of the F-T process have experienced steady growth over the past decade because of increased demand in the chemicals market. F-T waxes are used in industries producing candles, paints and coatings, resins, plastic, synthetic rubber, tires, and other products. Using projected natural gas and product prices in the AEO2014 Reference case and assuming a GTL plant can produce 2,800 barrels per day of products, a GTL plant is projected to be profitable only when it is configured to maximize wax production. As such, most GTL developers are looking to configure their plants to maximize wax production for the chemicals market instead of production of liquid fuels with minimum or no wax.